i wish i could meet up with you at the game, but only my husband is going. 1. I'm happy that I'll get to spend this weekend with Amy. 2. I'm happy that I'll spend next weekend with Craig (just the two of us). 3. I'm happy that I'm two loads away from being caught up on the laundry. I'm happy that I finally got a hair cut today - 1st one since January. I'm happy that some good friends from the states arrive here tomorrow. I'm happy that I got a lot accomplished in my house today. I'm happy that there was hardly anyone at the grocery store when I went this afternoon! I'm happy that my daughter started piano lessons. I'm happy that I get to watch a movie tonight with my hubby for his class. I'm happy that he's grilling burgers tonight, and we get to break open a bottle of my homemade apple sauce. And I'd BE happy to see a pick of your pigtails! I'm happy about seeing God's glorious creation of all the colors of the Aspen trees. I'm happy that baby girl seems content in her womb and growing and such. I'm happy that my little boy and I had a good morning snuggle!!! LOVE IT! Aw, LOVE the pigtails. I rock them with a hat many days also. And I'm happy that the sun is shining ALL WEEK and that our temps have been in the 70's. That's HUGE for us! Tell ya the whole story next week. Have fun kissing all over your baby nephew! Bring your lovely Colorado weather with you, too. We're tired of summer out here. Cute pigtails! Have a fun trip back home! Happy is just going around. I blogged about it, too. :) Enjoy your trip!! And I will be pulling for your Hogs. I am happy all three kids o'mine are sitting on the sofa right now next to my husband and I... all quietly reading. I am happy about your piggies. I am happy about my chick fil a soup for dinner and frozen yogurt for lunch. Way to rock the piggies, Mer! 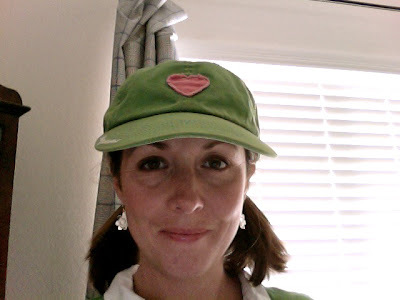 I love pigtails and a hat. I'm convinced the preschool moms don't know what I actually look like without them. :) At what point are we too old to pull that look off? what a cutie! love the pig tails!